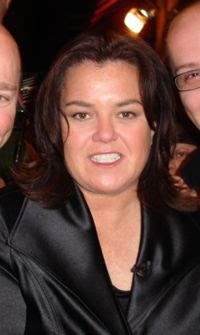 On April 25th, 2007, O'Donnell announced she would be leaving The View as a regular host when her one-year contract expires in June 2007, but would return as an occasional correspondent for special themed shows. So what do you all think of that? I personally am glad to see her go. While I don't watch the View, I'll be glad to stop seening Rosie's reaction to everything that happens in the world. And her feuds with everyone. Enough with the Rosie thing already! I remember back when she had her own show, Rosie, and she had Tom Selleck on the program one day. She attacked his stance on guns, and I haven't liked her ever since. What a mean thing to do. And between her and Trump, I'd take Trump any day of the week! While this isn't a bad picture of Rosie, I still don't like the sight of her. Yeah, I'm kind of surprised they didn't just give her the one year deal that she wanted. She's driven the show's ratings through the roof with her antics. From what I heard, the year before she came on the show, their ratings had fallen quite a bit. Now, they're only up 15%. Maybe they're tired of all the controversy, or worried that one of these times, she's gonna offend the wrong people. Who knows. No such thing as bad publicity though. I know I've talked about the View more in the last year than I had prior. Not that I talk about the View a lot or anything. They wanted Rosie signed to a three year contract, but she only wanted one. I think that was the major hold up. not that i wanted them to or anything, but I agree, they should have signed her for just a year. but who knows that TV executives are thinking! They take off the good shows, leave the crappy ones....who can tell ?